The Icelandic village of Vik is about 180 kilometers from Reykjavik (about a 2 hour drive). The basalt rock columns seen in this photo rise above the sea and provide a dramatic backdrop during sunset. The folklore behind these striking columns is that they are former Trolls who were trying to drag their boats out to sea, but were caught by the sunrise. Because trolls are creatures of the night, the daylight froze them into the columns you see rising from the Atlantic. 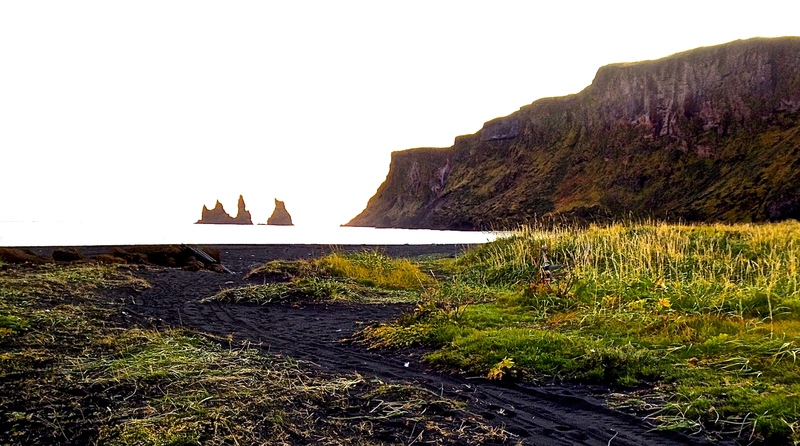 Vik is particularly famous for its black sand beaches – the black sand being the black basalt. Another interesting find here is the Puffin bird- it can be spotted in the Vik beaches during its nesting season. Plan a visit in late June, July or August when the weather is the warmest and the days are the longest. Summer travel, while more expensive, allows you to make the most of your time there. During the longest days in the summer, the sun will set after midnight and rise again around 3 am! If you want to get the best deals on hotels in Iceland, you may choose to travel in May or September. Remember, because of Iceland’s proximity to the North Pole, the days become shorter quickly, leaving less time to explore Iceland’s natural beauty. The near 24 hours of daylight plummets to 11 hours of daylight by mid September. Although that is still plenty of time to explore, Vik is two hours from both Reykjavik and Jökulsárlón. Thus, long drives between destinations, especially at night, is more challenging on poorly lit roads. In the summer months you will need plenty of layers. During the day the temperature could be 60 to 65 degrees Fahrenheit (or about 15 degrees Celsius), but at night it can drop as low as 45 degrees Fahrenheit. Bring waterproof boots as well. Even though it may not rain, the beach at Vik is cold and damp-definitely not the traditional “toes in the sand” situation. If you plan to travel off season, bring a winter coat, hat, and gloves. Made obvious by the country’s name, it is cold here. The easiest way is by renting a car. Several tour companies will also offer tours from Reykjavik (379 kilometers away) to Jökulsárlón, which will stop in Vik along the way. However, this will limit the amount of time you can spend here. 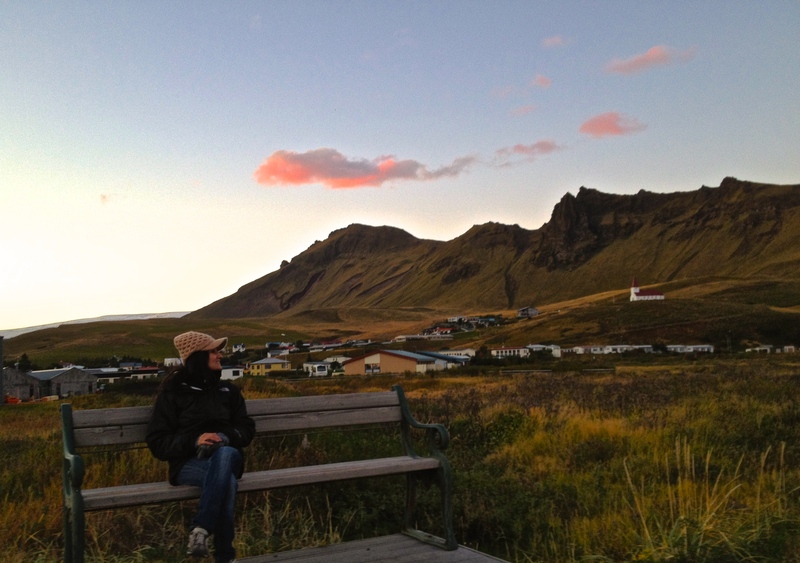 For the most freedom, rent a car, and plan to stay overnight in Vik. Vik is located right off the Route 1 ring road. The cheapest way to get to Vik is to hitchhike or take a bus. Although I did not hitchhike, if there’s any country to try it in, this would be it. There is one major road in the country and it has the lowest crime rates. Another option is taking Strætó, which provides bus service in the capital and to other parts of Iceland. Bus route 51 travels from Reykjavik (the bus stop in the capital city is called “Mjodd”) to Vik as well as Jökulsárlón. In addition to Vik, Jökulsárlón is one of Iceland’s most famous sites. It is 2 hours from Vik. Along Iceland’s southern coast, you will also find the striking waterfall of Skogafoss. Closer to the capital city, is the famous Golden Circle route which covers geysirs, the Thingvellir National Park, and Gulfoss (another waterfall).